G5 Esthetic Facial Beauty Spa Face Wand Massager. The G5 is the professional grade brand used by professional athletes, physical therapists, massage therapists, spa's, resorts and respiratory therapists and is also found in the clinical environment. An invaluable tool for assisting in the facial massage process. 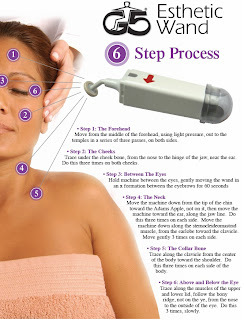 This great massager works perfect when used in the 6-Steps outlined below! The G5 Esthetic Wand is a gentle, quiet, Directional-Stroking model designed specifically for facial applications. The Esthetic Massager is small enough for easy portability and is powered by a single "C" cell replaceable battery, and weighs less than five ounces. Comes with two (2) Directional-Stroking® disposable applicators and one vibration applicator. We also back every G5 that we sell with our 100% money back guarantee. If you have any questions please call us at (701)223-9936 or Toll Free (800)355-2956. - Soft rubber end cushions unit in the event of a fall. - Red Arrow indicates the direction of fluid movement. - Comes with three different applicators. - Unit Weight - 6 oz. G5™ Brand Medical Devices, G5 Brand Percussors and G5 Brand Massage Machines are recognized as the most Powerful, Reliable, and Durable in the world. For more than 45 years the G5 Brand has served the medical massage needs of Respiratory Therapy, Physical Therapy, Chiropractic, Sports Medicine and Spa & Salon segments of the medical marketplace. On January 1st, Balkowitsch Enterprises, Inc. has negotiated to be the Master Distributor for the Prestige Classic 2100 Autoclave out of the United Kindgom. Balkowitsch enterprises has sold thousands of these autoclaves over the year and this new agreement opens the door to better distribution of this product throughout the United States. 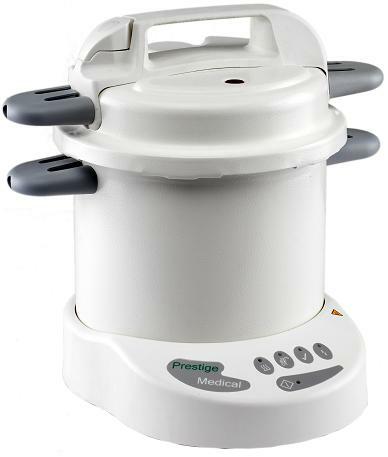 If you would like to be a distributor of the Prestige Autoclave please contact us at (800)355-2956.